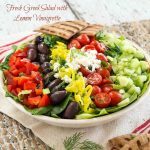 This Fresh Greek Salad with Lemon Vinaigrette has a ton of flavors and textures and it tastes nice and bright from the lemon vinaigrette. 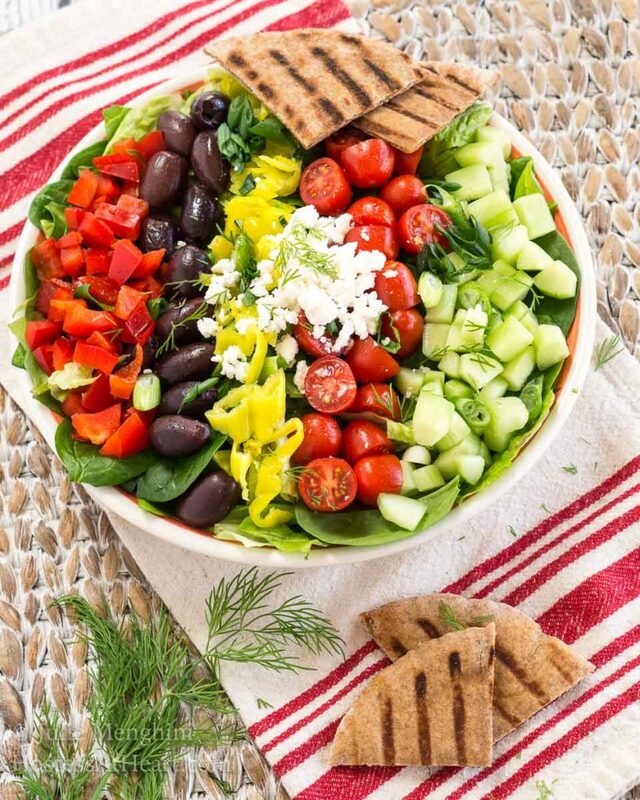 The only thing that this Fresh Greek Salad with Lemon Vinaigrette is going to sneak in is great flavors and textures. It will leave you feeling satisfied without a serving of guilt. Salads can be so deceiving. I used to order a salad at a restaurant we liked thinking that I was making a smart eating choice while everyone else noshed other entries. That is until they started posting nutrition content on their website. My salad was 1200 calories! No wonder I loved it. What I’ve learned over the years is that I want a salad that isn’t your typical lettuce salad with a couple tomatoes thrown on top. Those salad to me are boring and they make me feel like your being punished for something. I want mixed greens and the goodies that bump up the flavors and textures without all of the calories. Cucumbers, olives, onions, feta, well you get the idea. Sometimes we’ll top this salad with grilled chicken or fish just to change things up and I love serving it with grilled pita bread. Plate greens and top with salad ingredients. Combine lemon vinaigrette ingredients together in a jar or curette. Shake and drizzle on salad. Grilled pitas can be served on the side. I don’t have to tell you all of the health benefits of Mediterranean ingredients. They’re heart-healthy which is important for all of us. Another thing that I like about these ingredients is that they are available year around. I don’t have to be in the sunny Mediterranean to get them even though that would be amazing too! 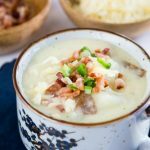 Here are a couple other amazing recipes! 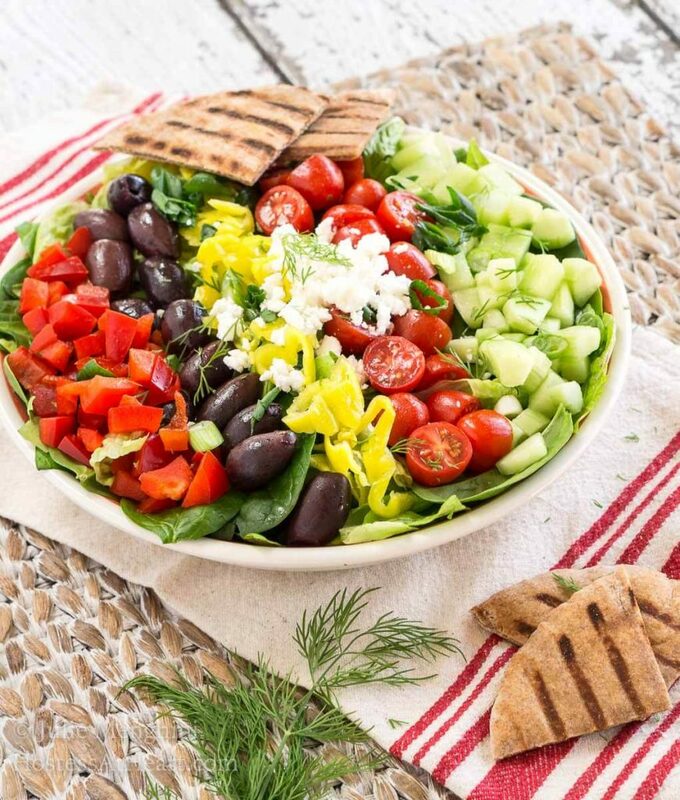 Greek salad is one of my favorites and your version of Greek salad sounds delicious. I agree that some salads are not the most slimming and dressings can be laden with calories! Thank you Petra! This one is one of my favs! Julie, your salad looks beautiful and so colorful. It sounds wonderful! Thank you Arl! I love a loaded salad especially when it’s waistline friendly. Thank you. I love when salads are served like this. The goodies don’t all end up on the bottom. Beautiful salad, Julie! I love Greek salads! Thank you Nancy. I love these salads that are so yummy and a complete meal. This is so bright and colorful! A perfect spring salad. Thank you Jenny! They sure help shake off the winter doldrums. When I’m craving salad, it’s usually a Greek salad. All that crunch, flavors, brine olives, sweet roasted peppers. Mmmm. Sounds like dinner! Thank you, Christie! I love the clean flavors of this salad. Now I’m craving a big serving of Greek salad. 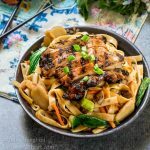 This is way better than any restaurant version! Thank you, Sandra! I can definitely eat this one over and over! I could eat this all day long! Shoveling in mouthfuls with some warm pita. That dressing I could just dip my pita in by itself. 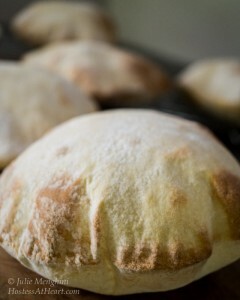 Going to check out your pita bread recipe too! Thank you, Jennifer! It was really good and it’s a lot of fun to make those pitas! 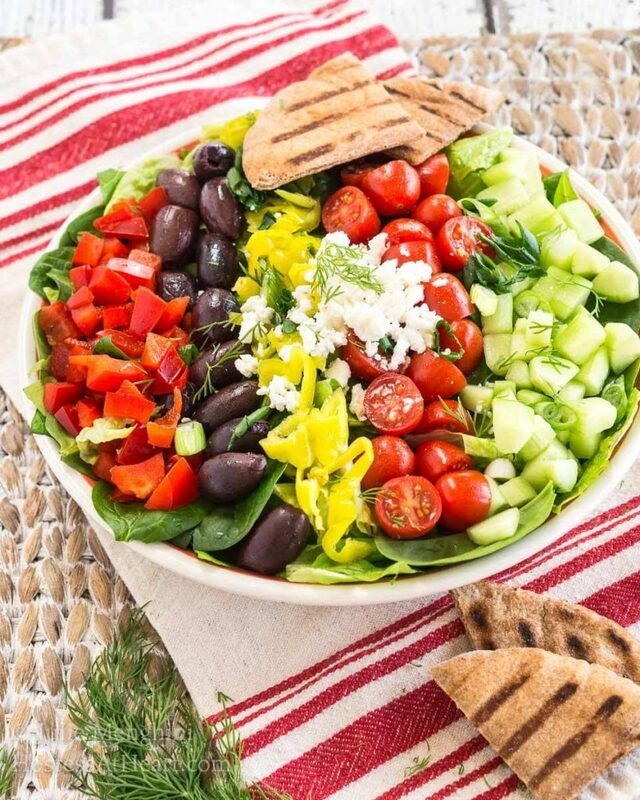 Greek salad is my FAVORITE of ALL salads!! This is stunning, Julie! Thank you Michaela! I love a salad that is yummy and doesn’t make me fear swimsuit season LOL (well there are other reasons to fear swimsuit season)! Julie, this is gorgeous! I feel like I could just reach into my screen and grab it! Then I’d run off with it and devour the whole fresh, beautiful salad! Thank you, Mollie! You’re so darned cute. I love salads like this too! This salad is beautiful!!! YUM!!! This looks wonderful – so colorful and bright! And I saw that pita bread on here, this would be great to stuff inside that pita! Yum yum – oh, maybe with a little hummus too! That all sounds amazing Debi! I love all of those flavors together. It’s nice that they don’t blow the daily calorie bank too! Thank you, Julianna! I love a great salad too and we really enjoyed this one. I absolutely love Greek Salads. Definitely will be trying yours! Thank you, Michelle! We really enjoyed this one. I think I love anything Greek! Thank you Judi! John says no to olives too! I’ll gladly take them. I like kalmata but don’t love black olives much when in dishes. I just figured out the Auto Draft thing after two days. For some crazy reason my recipe card didn’t have the title in it. If you pinned it it should be updated with the correct title. I appreciate you letting me know! This sounds great! So fresh and delicious, perfect for spring. 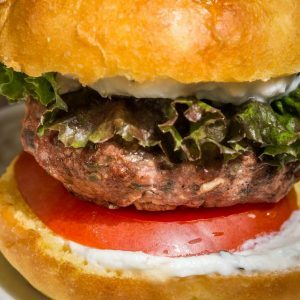 I hate when I order a salad at a restaurant and realize getting a burger would have been fewer calories. Thank you, Sarah! I know what you mean. I was so disappointed when I found out I could have eaten twice the amount of food (not that I could have) at less calories LOL! “…feeling satisfied without a serving of guilt.” I love that, Julie. 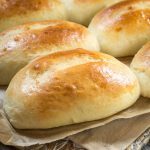 Since I am into Whole30, I am conscious about what I eat. I did cheat twice during the second round and I felt a little bad after. I am sure this salad would leave my tummy full and my body happy. Thanks for sharing such healthy and yummy salad like this. Happy Fiesta Friday and thanks for coming! Have a lovely weekend! Thank you, Jhuls! I’m sure you’re doing great on the whole30 program. No need to feel guilt for a little lapse. We are human right? Thank you for hosting FF this week. That’s a dangerous endeavor for any of us watching our figures! Thank you, Monika! Dishes like this just put me in a better mood and make me feel like summer is indeed on it’s way! Link back yours as well! Great minds (and tummy’s) think alike! I can’t wait to see your salad and you definitely don’t need to link back. I didn’t invent it, this is only my version. How I wish that I would have an original recipe get as popular as this one though. That would be amazing! I just finished a take-out Greek salad and it wasn’t half as good as yours looks. I can’t believe I’ve never thought grill pita bread before. 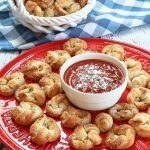 I have to try your recipe and some grilled pita along with it :). This looks great! Thank you so much Kelsie! 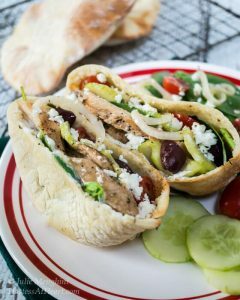 I just love flat bread or pitas grilled with a salad like this.